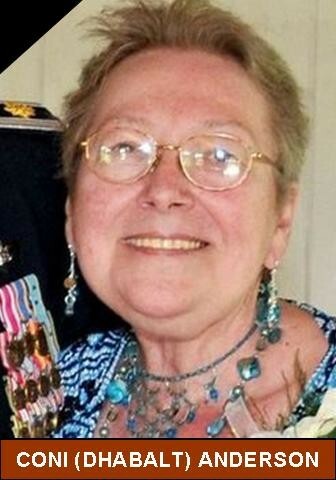 Coni Faye Anderson (Dhabalt), 65, of Clarksville, AR, formerly of Moline, IL, passed away on January 28, 2010 at Lamar Nursing Home in Lamar, Arkansas due to complications from a stroke. Services will be held at Esterdahl Mortuary & Crematory, Ltd., 6601 38th Ave, Moline, IL 61265, Wednesday, February 3rd. The visitation will be at 10:00 am followed by a memorial service at 11:00. Memorials may be made to the American Cancer Society. She was born on September 26, 1944 in Moline, IL to Jerry and Lois Dhabalt. She graduated from Moline High School in 1962. She married David William Teuscher (later divorced) of Rock Island in 1964. In 1988 she married Kenneth Dean Anderson and resided in Clarksville, Arkansas. Surviving are: her husband Ken Anderson ; three brothers, Richard (Kathy) Dhabalt, Dennis (Marylin) Dhabalt, and Larry (Sue) Dhabalt; two children, Jennifer Teuscher of Lisle, IL and Jeff (Robyn) Teuscher of Marquette Heights, IL; her step daughter Kelly Jo Mapes of Cleveland, IL ; her step daughter Marvel (David) Anderson of Clarksville AR, four granddaughters and two great-grand children. She spent most of her life in the Quad City area and was well known for her cooking and vibrant personality. She managed The Peppercorn Grill in Bettendorf, IA and the Elks Club and Miss Mamie’s in Moline, IL. She spent countless hours sewing baby blankets for family and friends. She loved telling stories and her smile could light up any room. She will be sadly missed by her family and all that knew and loved her. She touched many lives and her memory will live on forever. I will always remember connie as a fun loving person at John Deere, I know the world will miss her. May God Bless her!